The Concerts on the Quad series at Bates College concludes with Maine jazz and soul artist Stephanie Fogg and her band at 6:30 p.m. Thursday, Aug. 13, on the Coram Library porch on Bates’ Historic Quad, College Street and Campus Avenue. (The rain site is the nearby Peter J. Gomes Chapel, 275 College St.). Admission to this family-friendly series is free, and audience members are encouraged to bring picnics and chairs or blankets. For more information, please call 207-753-6953. 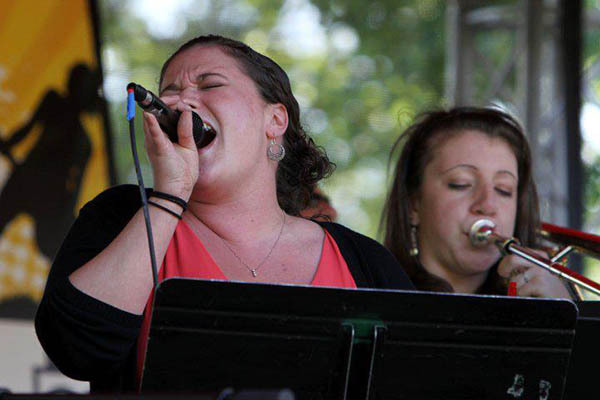 Hailing from Portland, Maine, Fogg is an experienced vocalist and an instructor at the Midcoast School of Music. Growing up listening to jazz and soul artists like Aretha Franklin, Otis Redding, and Etta James inspired Fogg’s love of singing from a young age. Fogg has toured widely throughout New England. The Stephanie Fogg Band’s recent gigs have included performances of Back to Black, the second and final album by the late and lamented Amy Winehouse, in its entirety. Supporting Fogg are guitarists Mike Derosier and Seth Warner, drummer Chris Marro, bassist Duane Edwards, keyboardist Matt Fogg, and saxophonist David Wells.